Jane Shilling’s life is a mess. Her mother died a year ago in a car crash, and her father has spent the time in a mournful, alcoholic haze. Rachel is perky, funny, and smart, with a boyfriend and her university studies to keep her busy. Elana, a twenty-something grad student, is a staunch feminist working on her grad thesis about Edna St. Vincent Millay. Elana seems to take a perverse pride in yelling at people who violate her sensibilities. Then there’s Ethan, broody, emo Ethan, a former druggie who’s gone straight-edge since his “friend” Jeff was killed in a motorcycle wreck. Ethan wishes he’d gone with him. Jane has big problems at school. She attends a special program called Spectrum, which is a haven for those with behavioral learning disabilities. Jane’s pathology is that she doesn’t like doing homework—her math teacher is her archnemesis—but she’s brilliant at writing end-of-year theses on each class. Spectrum being as liberal as it is lets Jane get away with it. Meantime, Jane enjoys watching Look to Tomorrow—one of the hottest shows on tv—and reading her friends’ posts on the LtT fansites, even writing the odd piece of fan fiction. The problem is that Jane is Rachel; Jane is Elana, and Jane is Ethan. What started as a joke one time—creating a false internet persona—grew into an obsession. Jane-Rachel spends most of her online time on LtT websites. That’s where Rachel’s friends are, and she loves and is loved by them. Nobody treats Jane like damaged goods, and she’s funny, with popularity and friendships that Jane doesn’t have. Jane-Ethan only posts when Jane is sad, translating her real-life pain into Ethan’s dark world. Jane-Elana writes frequently and scholarly about Edna St. Vincent Millay’s poetry. But mainly, Jane is Rachel, because Rachel is Jane’s idea of what a young woman should be, what she should be. When Jane makes a real-life friend—Gary, the dork and champion Skee-Ball player—she feels lost. While Rachel has dated up a storm, Jane doesn’t know what to do on an actual date. Gary loves Jane, faults and all, and though he lacks her eloquence, he’s a good guy. Jane also falls under the care of a counselor named Nora. Jane eats counselors for lunch and spits them back out. Nora is older and completely computer illiterate. One day when Jane brings her laptop and spends time chatting online rather than listening to Nora, Nora asks Jane to help her set up an IM account. Jane does, and finds herself actually talking to her therapist via IM. They’ll be in the same office, and the only sound is typing. Later, something happens to Audra, one of the most-popular girls on the LtT fansite. Jane wants to go visit her in the hospital, but she’s afraid: Audra has no idea who Jane is, only Rachel, and Rachel’s pretty and outgoing and fun, three things Jane is NOT. Jane has created these three online personae from splinters of her own soul pieced together in a “more likely to be popular” way. As she grows closer to Gary and her newly sober dad, can she find Jane again? Or is Jane too far gone for help? 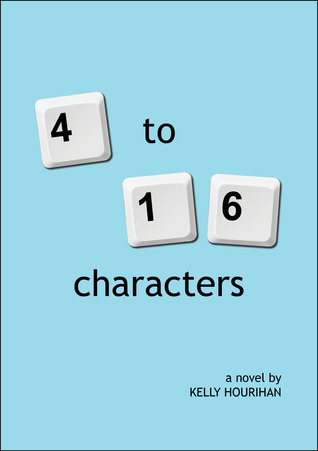 “4 to 16 Characters” haunted me, simply because I wonder how many of my online friends do this. I wonder to which degree I do it. Mainly I tell the truth, probably a hell of a lot more than my friends would like. I know most of them personally or as friends-of-friends, so I don’t doubt their veracity. I was thinking, though, how simple it would be to create a character—call him Claude McMuffin, for example—and have him be divorced with no kids and live in Mauai half the year. I could use clip art to show Claude’s island life, photos from luaus, etc, even dig up a nicely tanned Maui beachgirl named Lailani, Claude’s on-again-off-again lover. Flesh out the details of how he earned his money, and you’re in business. Author Kelly Hourihan chose the formidable task of presenting Jane only in online elements. We read her IM’s; we read her LtT posts and conversations, and we read her online diary. (If emoticons make you squeamish, keep a bucket handy.) The beauty of this approach is that it’s how people talk on the Internet. The Internet is where Jane’s life is—she has nothing going on in real life. Another beautiful touch it took me awhile to notice was how each of Jane’s online personae are mourning. Ethan, of course, is overtly death-obsessed. Elana’s choices for her Edna St. Vincent Millay poems tend to deal with grief; Jane appropriates the great poet’s words to express her own feelings, even though she distance the poems from her actual feelings by giving pseudo-scholarly analysis. But Rachel shows the most about the inner Jane. Yes, Rachel is super-upbeat and fun and has a cute boyfriend. What Rachel does is fill her fan-fic with Jane’s grief in the guise of an LtT character. Once I made that connection, I was blown away. Ms. Hourihan has written a book most people who read my review will understand. Not because my review is so studly and brilliant, but because you are accessing it via social media. You could be reading it in Goodreads. You might subscribe to my blog feeds through your e-mail or WordPress reader. If you’re my Facebook friend, you’ll see a post on my board, and if you get a Tweet from me in the next hour or so, it will say “5 out of 5 Stars to 4 to 16 Characters” followed by a short bit.ly URL. In other words, if you are reading this review, you will understand the technology Jane uses—Facebook, blogs, message boards, etc. Not only would you find this review through one of those paths I listed in the previous paragraph, you’d understand exactly how easily Jane could manage her stable of fake friends.